One could regard a team’s collective will to create strategic change as something powerful but intangible. Determination, tenacity and relentlessness are all key behaviours, but tricky to quantify. The diagram below, however, proves a valuable tool for leadership teams in assessing whether the conditions required for change are in place, as well as forcing the necessary conversations to happen at the outset. Source: Strategy&; adapted by Michael Hay. The four circles in the top line of the diagram above outline the essential ingredients of success for any shift in strategy. A strong collective will comes from alignment and concurrent movement against each of these four ingredients. The four rows below the top line lay bare what happens if one of these four ingredients is not present. To create the will to change, we first need the business pressure to change. Without a strong, clearly articulated business case for embarking on a new direction, the initiative will stall pretty quickly when the going gets tough. We need to feel the heat, or we move without urgency and run out of steam. We need a view of where we want to go, and why, which everyone needs to buy into. Without a shared vision, we run off in different directions — the very best outcome of which is that nothing gets done. We need some confidence that we have the capability and capacity to do what is being proposed — we may not know precisely how we are going to do it yet, but we know we have those kinds of capabilities. Finally we need to have mapped out the practical steps it will take, with realistic expectations in terms of timing and outcomes. If you look back on the strategic projects you may have been involved in but which haven’t had the impact you would have liked, the chances are that one or more of these key ingredients was not in place or maintained throughout the project. It’s a very simple tool, but a very useful one. As the U.S. Army notes, hope is not a method. • eatbigfish is a strategic brand consultancy with a single focus: challenger thinking and behaviour. The company exist to study challenger behaviour and work with businesses who want to become challengers themselves. 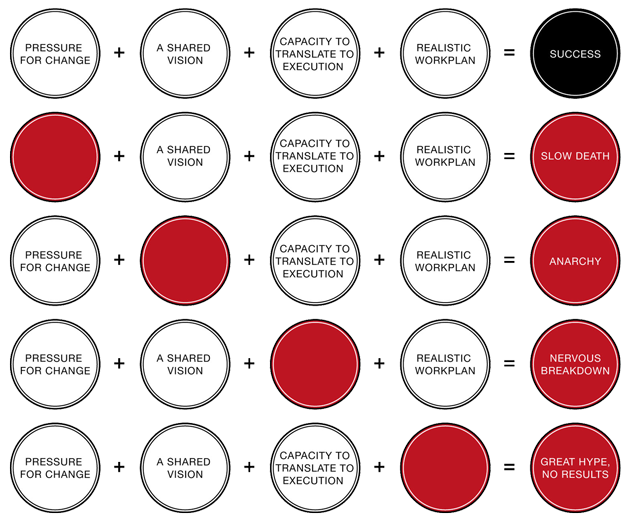 ‘The elements needed for successful change’ diagram was originally created by Strategy& and adapted by Michael Hay, a business leader who had both global strategy and creative roles during his fifteen years at IKEA.